Is there an easy way to detect clients that ignore certificate validation errors (in production)? It can be detected by providing a bad certificate and see if the client accepts it, but is there a standard feature so we can we configure web-servers in a way that they will deliberately do that the first time for every distinct client? ... but is there a standard feature so we can we configure web-servers in a way that they will deliberately do that the first time for every distinct client? There is no such feature. Since the TLS handshake (which serves the certificate) is done before any kind of application data (like a application specific user-agent header) gets submitted and since there is no kind of application-specific identifier in the TLS handshake too a server cannot figure out of this is a new type of client application or not and thus cannot behave differently. Sadly there is no such feature as it's the TLS handshake failing which is before it should ever hit application logic. However you might be missing the real problem here in all truth and honesty if someone has released code that is not verifying TLS correctly or is actively ignoring TLS errors. 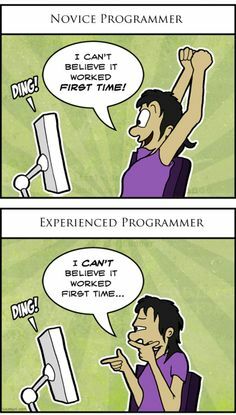 Of course this comic is missing the expert programmer: "Oh it's finally passing all of it's tests. Good." I think a bigger question is "Why does a developer need a self signed certificate?" and if the answer is "Testing" then there are much better, safer, and easier ways to handle testing that don't require certificates or servers. If a developer cannot figure out how to test code for a server or client application outside of a client and server environment then what is that code doing in the production code base and why is that developer not receiving help to bring them up to faster and safer practices and design patterns? With code being just that: code; there are infinitely many ways to test it that don't require a server, certificate, or even man hours. They should adopt those ways moving forward, and retroactively integrate those patterns into older code. "But what if a developer doesn't want to?" is a common argument against this. To that the answer is "Then go find a developer who believes in proper and safe design practices." End. Of. Story. It is not worth the bugs, headaches, and lost time/profit they will introduce with their rampant disregard for standards set in place by those more experienced than themselves they could learn from. It doesn't matter if they've have more years of experience either, because their experience is wrong. It's especially more so since these design practices are free and readily available. With a load of free resources and proper instruction it's a wonder that anything other than a small inexperienced company would ever run into this situation but it does happen. Even then it's not surprising that many of these companies eventually reach the same point in time where they do adopt these practices. In this example we are going to write a route handler that will log a visitor to the site, and then proceed to the next handler. As you can see we don't even NEED a server to test the code, or a self signed certificate or even a testing library(although that probably would have made it easier to test). Before this handler would ever go into a server, it would be tested. At that point the developer already knows it works as intended. It doesn't need a self signed certificate. It can also be proven that the tests work by running them. As long as you have proper testing, you don't need a self signed certificate. Not the answer you're looking for? Browse other questions tagged tls legal detection or ask your own question. Are there DNS analysis tools that could detect bad DNS results? Is there a way to detect web server in case it's not present in HEADER? What happens when an x509 CA certificate expires? Is there a way my organization can collect clients' sensitive documents without being liable for them? SSL authentication unexpectedly failing - could this be caused by SSL Inspection/Fortinet?